Today’s poem is a reprise. But it helps me remember this key to life and how to practice. And it is an echo of an experience Rosemary and I shared last evening; and that experience, too, was an echo of an earlier experience two years ago! Echoes within echoes, the cycle of time! We helped sponsor, organize and share Ashana here in Annapolis for a concert Saturday night and an Activation Sunday evening. The Activation was powerful, a Kundalini Yoga experience of profound depth accompanied by Ashana’s amazing crystal bowls and angelic voice. For four hours we worked on opening and balancing our lower three chakras. This in turn helps open the upper three, all centered around the heart chakra. It was both deeply grounding helping us get in touch with the Earth, our Mother, and soaringly uplifting as we sailed and sang with the Angels! And I reread this poem and remembered again that all is in balance; we all just need to remember! The power of life in the Universe. The acceptance of All in the Universe. Every dish alive with energy. It is a meal for another. Your unique gifts are essential. There are others ready to serve. Your karmic journey is open. Fully embracing your sense of place. Today’s divination is very auspicious; the energies the New Moon brought in are strong yet balanced; and even as they change (I means change) the auspiciousness of the time grows! The initial Gua I cast (I use the 50-yarrow stalk method) is pictured here. The bottom trigram is Qian meaning Heaven. These were all 7s, strong Yang lines forming a very sturdy foundation for the month. The upper trigram was formed by two 8s and a 9; two strong yin lines and a weak Yang line. The top 9 then shifts to an open Yin line forming the new “accomplished” Gua (see that hexagram below). 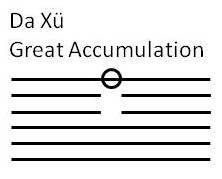 The initial Gua is composed of “Mountain” over “Heaven” and means “great accumulation.” In the sequence of the 64 hexagrams that compose the I Ching great accumulation follows “Without Falsehood.” The implication is “when truthful there is great accumulation of virtue.” And with virtue comes great power, wealth and prosperity. We are entering harvest time. It will be a good, even great harvest. In the hexagram Heaven is below Mountain. The image is of clouds hanging within the mountains accumulating cooling and nourishing rain – a majestic image! And this is a good sign for continuing fair weather for the abundant harvest. To capture an image of this, one sees that the top line of the initial Gua “opens” as it changes. This opening lets the accumulation of virtue flow out in “advancement” and we use the accumulation to good purpose. The accomplished Gua means it is favorable to take action. It is a time of unity and harmony. As we advance in the year toward the Autumnal Equinox, as this Moon-cycle begins to wane, we can move into the balance point in the Sun-cycle. Harvest is great. 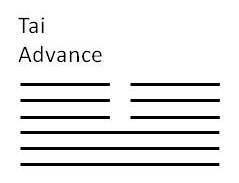 Accumulate great virtue over the next few weeks and on that strength advance toward balance and harmony! Through “great accumulation” of virtue we make gains “of value to others.” From this accumulation we “advance” and offer our gains as “our high service.” And we do this from a point of harmony and balance! As I wrote in yesterday’s post I am visiting my brothers on the family farm in Wisconsin. I was here for yesterday’s full moon; it was huge and bright here as only it can be in the countryside where it still gets much darker at night than what I usually experience on the east coast. Here is where I got part of my starry-eyed wanderlust when I was a kid looking up at the brilliant night sky, the dense and bright Milky Way streaking overhead and the astounding constellations of the Wheel revolving through the seasons. I was thrilled to see the aurora borealis occasionally in the cold winter nights. And I always loved the rising of Sirius around the time of my birthday. The sky part of being back here hasn’t changed over the years; I can still come back to that. To celebrate the Full Moon we were out in my brother’s garden bringing in a pail full of green beans, a few remaining peas, an awesome head of cauliflower and some still sweat lettuce coming back after welcome rain. So we did our harvesting for the day and are now enjoying the bounty. And I’ll be here for the Equinox on Sunday – equal parts night and day. This will be a time for reflecting on balance. And it is good to be here in the place I grew up to ponder the balance in my life: the maturing urbanite and the farm-boy, the world traveler and the small-town bumpkin, the spiritual seeker with the grounded and earthy dirt-farmer son. It is always a good thing to look for balance, not just at equinoxes, but all through the year. Balance begins with inner reflection; the inner is always reflected outwardly. Outer signs of balance, like Sunday’s Equinox, are there to remind us to go inside to find the balance. I must admit I am somewhat unbalanced by this visit to the family farm; as I wrote yesterday I have discovered it is no longer “home” for me; not even a little bit. I continue to reconcile, or balance, this finding for myself. I think I will be doing some grounding work when I get back to Maryland; the grounding that may have been a vestige of my youth here in Wisconsin needs to be transplanted once and for all. Or maybe it just needs to be replanted in my heart as the physical grounding to place recedes as an important element in my life. Sandwiched between Full Moon and Equinox is my 50th High School reunion! I will be joining my former classmates for a dinner tonight. Will I recognize anyone? Yesterday my brother and I had breakfast in the hometown café; a couple was also in the restaurant; I knew I knew them but could not place faces with names. The wife recognized me not by my looks but by my voice! And I thought I had worked so hard to neutralize my Wisconsin accent! Betty Lou, three years my senior, looks much the same as when we rode the school bus together the seven miles into town. But recalling names is quite another matter. I hope they give us nametags so I’m not guessing wrong! I’ll spend Sunday visiting and catching up with family. I fly home on Monday to get back to routines, qigong classes and a re-balancing. And I’ll take a piece of my old “home” with me in my heart. Where do you call home? Do you attend school reunions? How do you balance all the experiences of “home” with your life now? Take a peak inside for the answers.